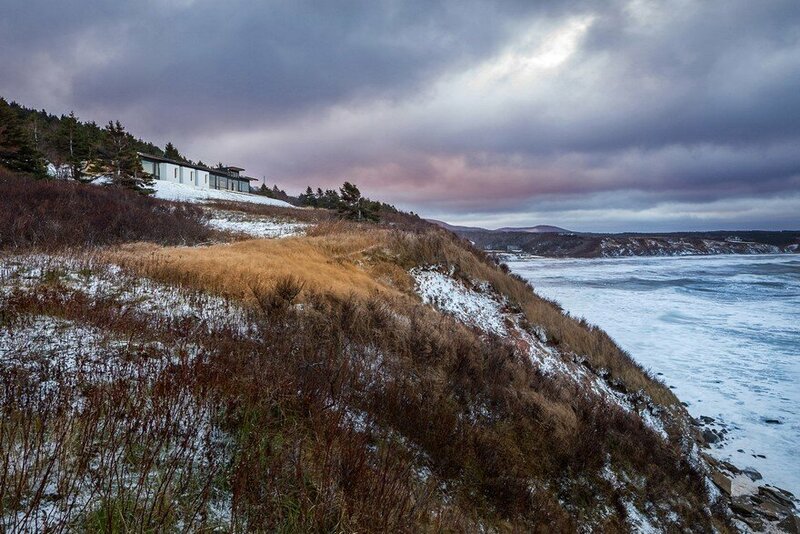 The Lookout at Broad Cove Marsh is situated delicately along a narrow piece of land between a tree-lined country road and a dramatic ocean-side cliff. 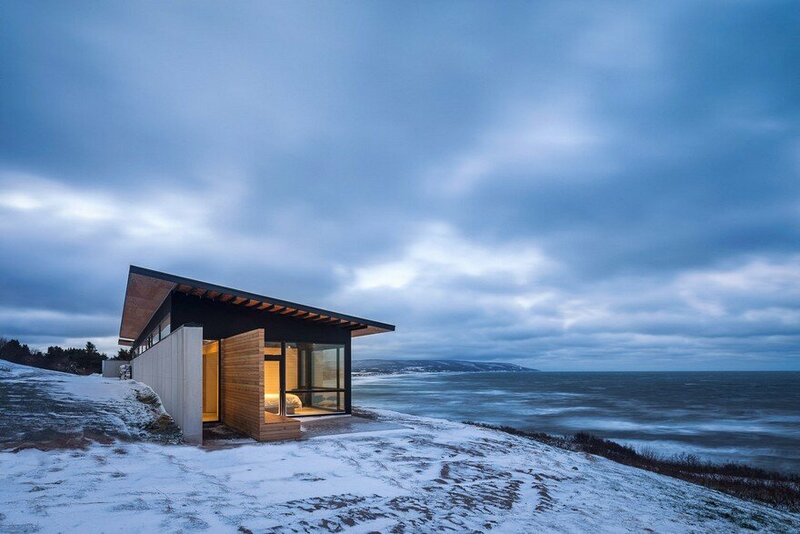 The project is located on Broad Cove Marsh Road on the outskirts of Inverness, Cape Breton Island, a small coastal community popular among tourists and seasonal dwellers for to its sandy beaches and dunes, steep cliffs along the Cabot Trail, and world-class golf courses. 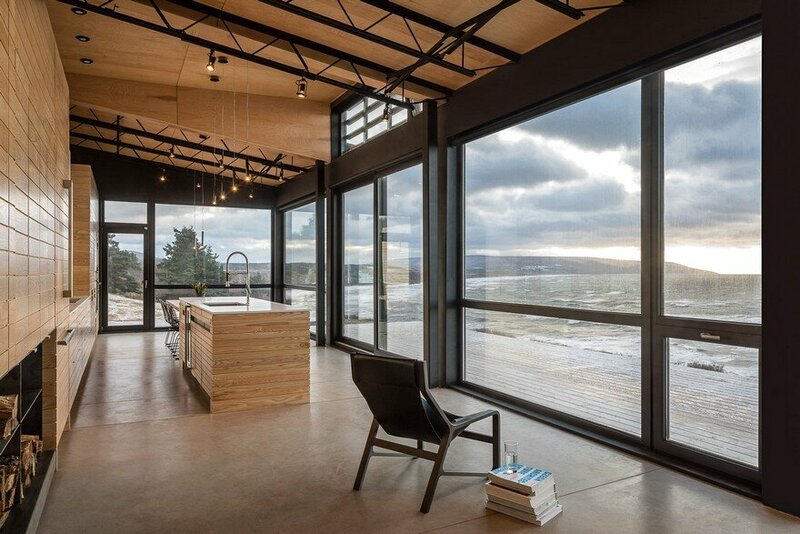 The clients —a married couple from Toronto, and proud parents of three grown-up kids—purchased the long sliver of coastline for its expansive sunset views over the Gulf of St. Lawrence, its adjacency to the serene fairways and jagged cliffs of the Cabot Cliffs golf course, and to build a place to bring family together. 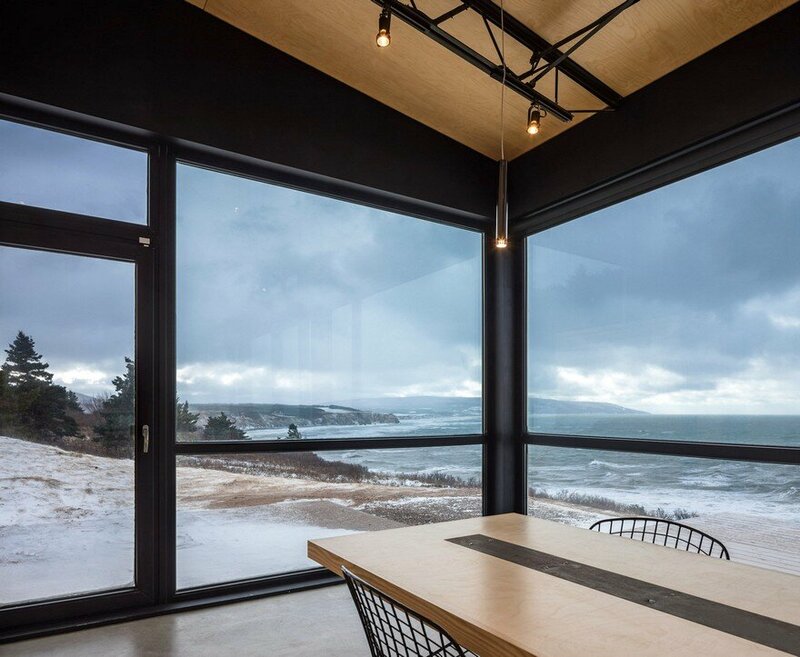 The seasonal residence is defined by a single loaded corridor running parallel to the length of the property, with a series of open and private spaces overlooking the ocean cliff. 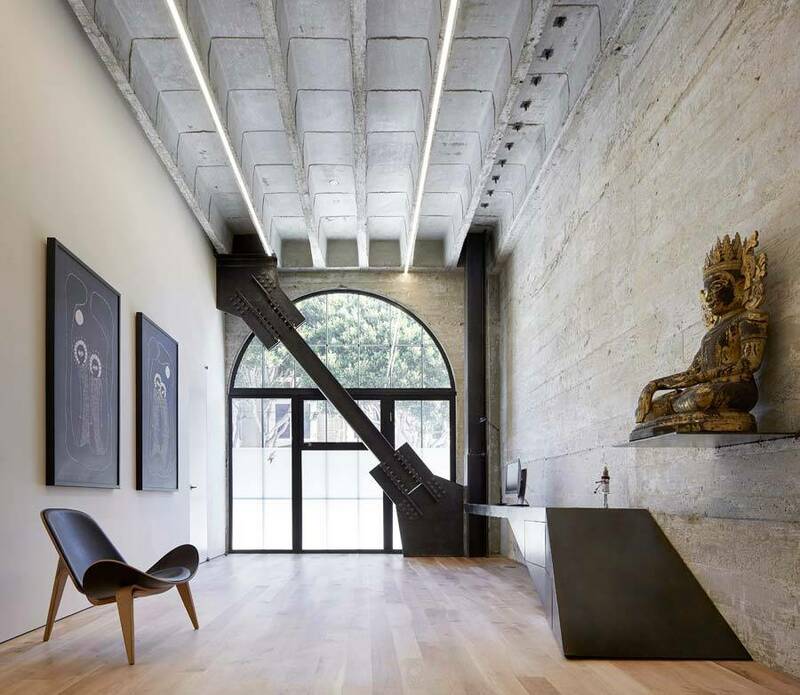 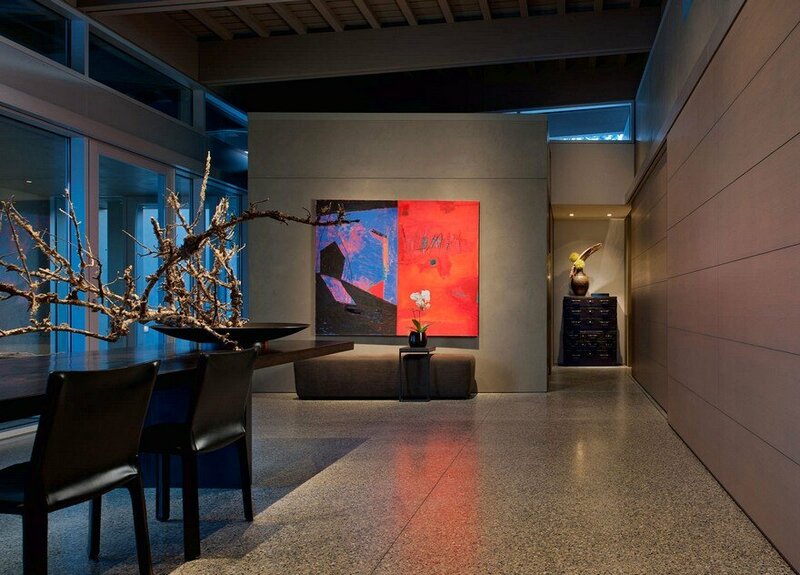 The corridor is anchored by an exposed concrete retaining wall on the exterior wall and a 48-foot continuous run of board-clad millwork, which slips seamlessly from exterior to interior and then continues again on the far side of the residence. 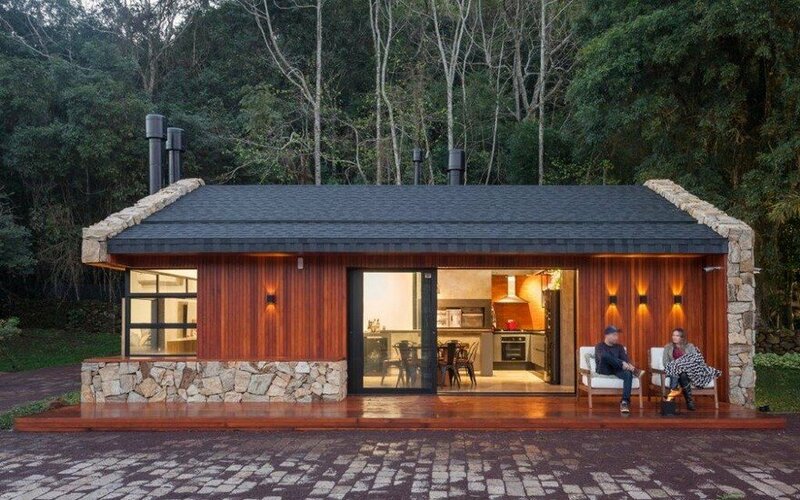 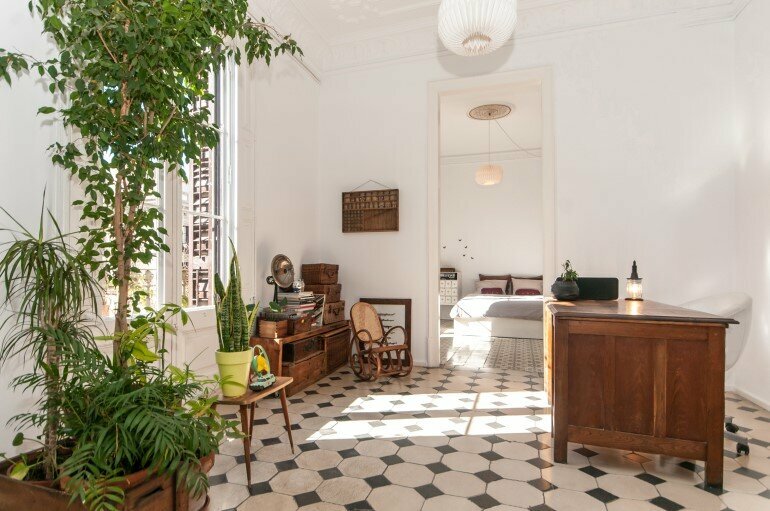 Programmatically, one half of the dwelling is composed of an indoor/outdoor great room that includes areas for relaxing, cooking, and hosting. 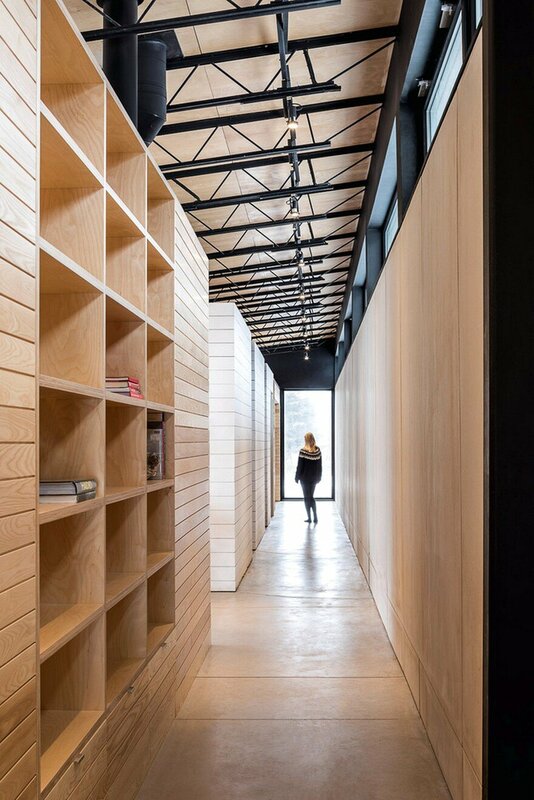 This open space is anchored by an 18-foot long island which shares food prep and dining. 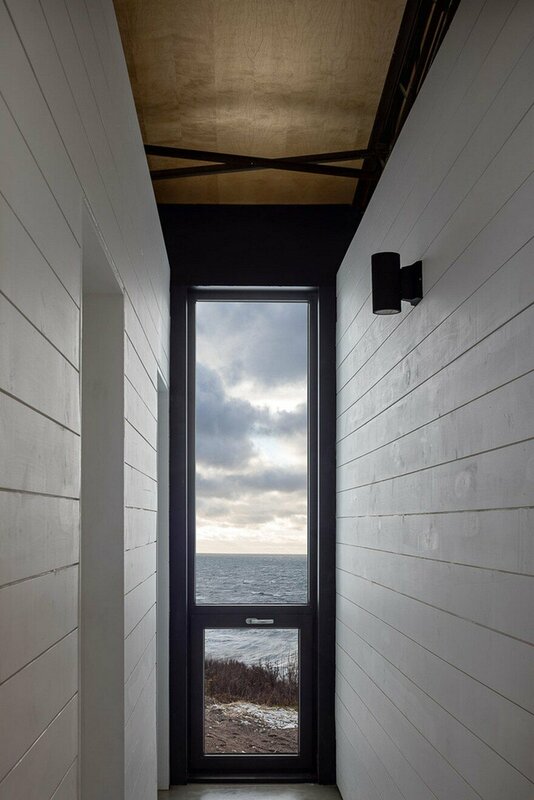 On the other end of the house, three repeating pod-like units slip past the ocean-side glazing to plug into the corridor, and thereby delineate the private spaces of bedrooms and bathrooms. 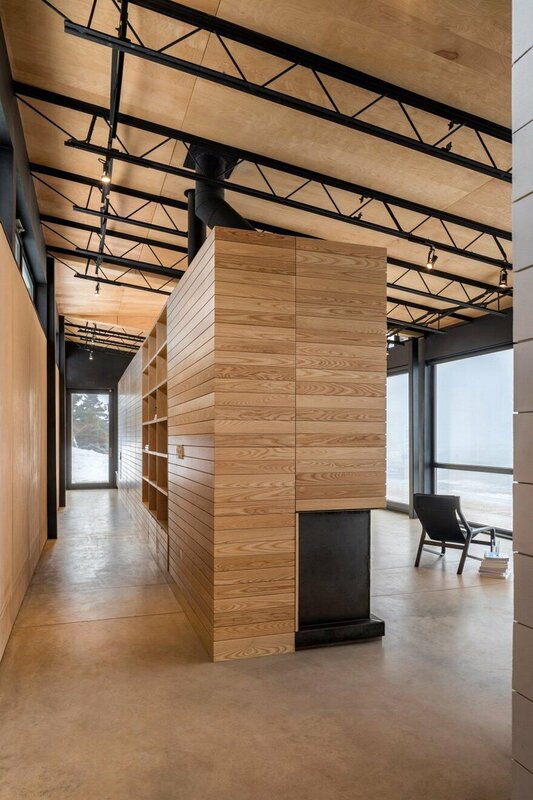 In contrast to the concrete finish of the groundwork (retaining wall and floor slab) and the fine-grain natural finish of the wooden service bars, the pods are lined with white-washed locally sourced spruce boards of a wider dimensions. 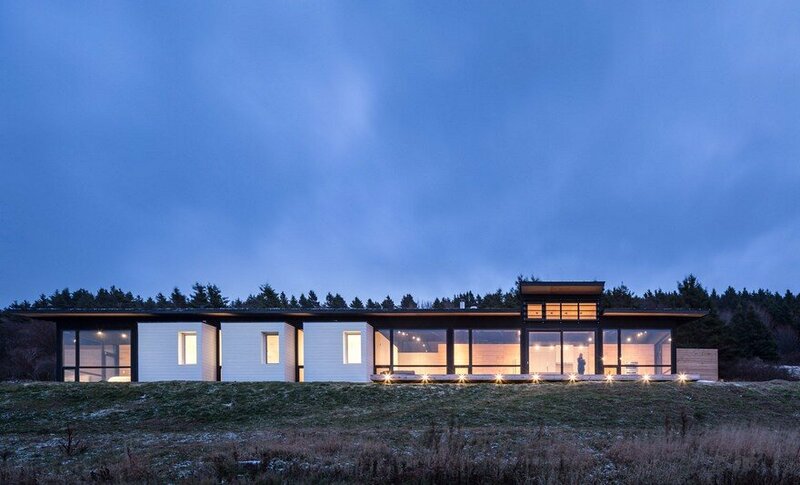 The south-west face of the dwelling (private side) opens to the views of the Atlantic with floor-to-ceiling glass, while the long strip of clerestory sitting atop the retaining wall (public side) allows a continuous run of gentle north-east light to peer in. 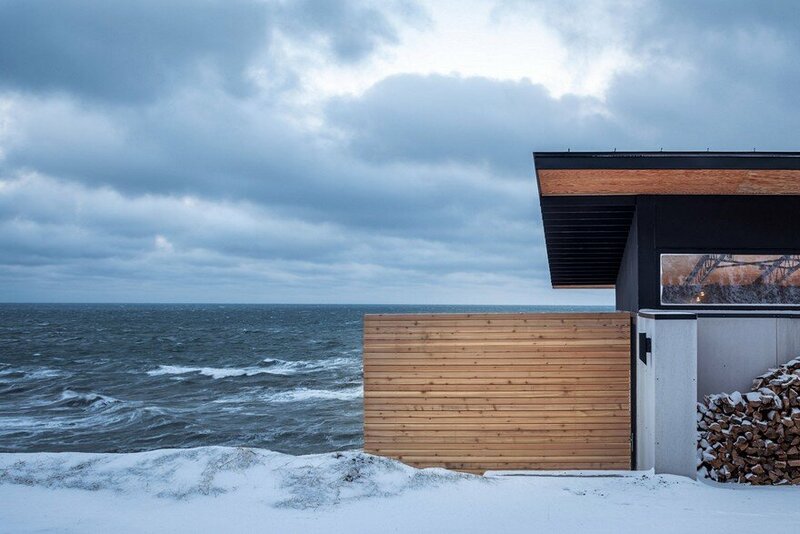 A simple, reverse-shed roof floats the length of the building like a low-slung hat, shielding the interiors from the more intense summer sun while exaggerating the horizontality of the sea and landscape. 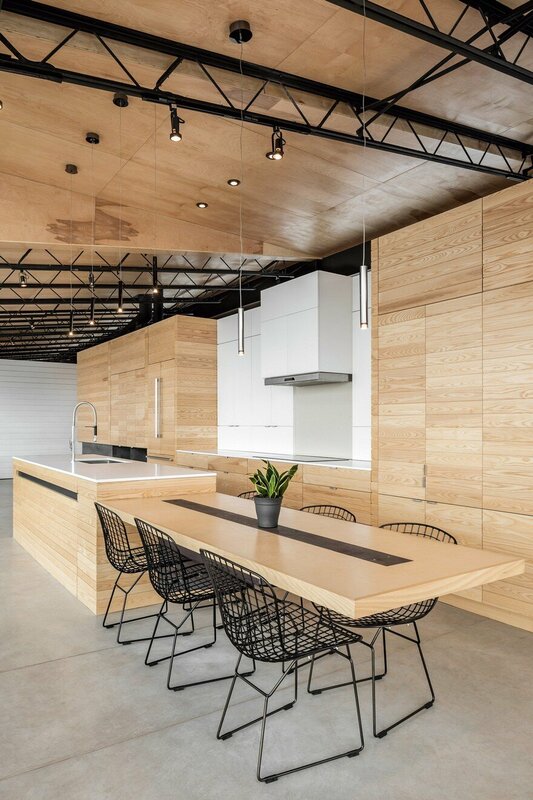 Atop the kitchen, a portion of the roof lifts up like an open cassette deck to allow more light to trickle in—moderated a low-tech wood brise-soleil—and to punctuate the heart of the social space.